Participation is a vital element of working with children and young people – ensuring that services are meeting their needs as well as promoting citizenship, resilience and general well-being. 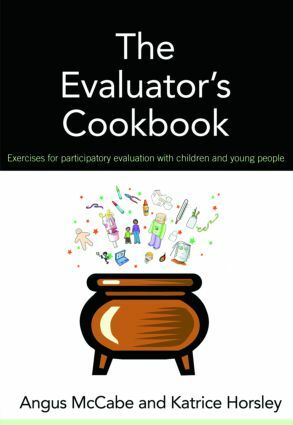 The Evaluator’s Cookbook contains 21 participatory evaluation exercises for use with children, young people and families/community groups. Attractively and clearly presented, the exercises are very easy to use and come with suggestions for use and instructions on how to create the equipment needed. They will appeal to a wide range of people and can be used in a variety of informal and formal settings and most of the exercises are suitable for use with disabled children or children with special needs, as well as people with English as a second language. The book also explores why, how and where participatory research and evaluation should take place and provides suggestions on how the findings can be presented in imaginative ways. This unique book is an invaluable resource for those wishing to consult with children and families or evaluate social, health and education services in diverse cultural settings.